Susan wanted to sing from the hilltops like Julie Andrews. Michael and Cindy agreed with her raving. So I expected great things from Susan’s Cauliflower Dal with Panch Phoran. I had this dahl in mind when I purchased a packet of Panch Phoran (or Panch Puran as my packet says) from a local Indian grocery store. Panch Phoran is a mixture of mustard, cumin, fennel, fenugreek and kalonji (nigella) seeds in equal measure. I thought this must be a fairly authentic Indian flavouring. But Wikipedia tells me that in Bengal, ‘the cradle of this mixture’ radhuni would be used in place of mustard seeds. I find that spicy sludgy dahl is a great comfort food. It feels like the Indian equivalent of baked beans. This new spice combination interested me as a way of reinvigorating an old favourite. The seed mix is a pretty one with different colours and shapes. When I opened the packet I was hit by a heady fragrance that really was a change from the spices I habitually use. The liquorice smells of fennel and fenugreek were particularly powerful, possibly because these are spices I don’t use much. When I tempered the seeds (which I have just discovered is when you fry them in ghee or oil until they start to pop) the smell was fantastic and had much more depth than just liquorice. I was really looking forward to this dahl. Unfortunately, once I had simmered the lentils and vegetables, the fragrant spices had faded into the background and I found this dahl to be a little on the bland side. E doused it with Tabasco sauce. I was a little disappointed. Possibly it was because I neglected to follow Susan’s instructions and cook the lentils separately. It seemed a waste of another saucepan but maybe would have made sure more of the panch phoran flavour was imparted. I also added a few extra vegetables but I don’t think this would have made much difference to the spices. The recipe also required being a little prepared rather than chopping as I go, which is my usual way! A little more experimenting is in order, I think as I want to be able to taste these wonderful spices. Not only was I cooking with an unfamiliar spice mix but I was also baking Ricki’s quinoa muffins against the clock while the dahl cooked. Why? Because it was earth hour when everyone was encouraged to turn off their lights at 8pm to raise awareness of global warming. I didn’t want to be cooking by candlelight so I was racing to have the dahl served and muffins in the oven by 8pm. I served dinner and managed to take a picture of the meal at 7.59pm. Then we sat and ate our dahl with rice and quinoa by candlelight. While the lentils are cooking, prepare the vegetables. Heat a large stockpot and add oil. Add panch phoran and stir til the seeds start to pop (this is the tempering). Add onions and ginger and fry 2 minutes or til onion is starting to soften. Add chilli paste and garlic and fry 1 minute. Add the tomatoes, cauliflower, pumpkin, peas and ½ cup water, and stir to coat vegetables with spices. Cover and cook for 10 minutes or until the cauliflower is just tender. Add cooked lentils to the cauliflower mixture. Stir well, and add further seasoning if required. Simmer gently for about 10 minutes to allow flavors to blend. I served mine with a mix of brown rice and quinoa and highly recommend this. Yesterday E and I were in the city making major purchases (a laptop for him and a bread tin for me!) and we were heading for a coffee and cake, when we passed the GPO. I suddenly was struck with a yen to show E the quirky sushi I had found here months ago. The GPO is Melbourne’s former general post office and like so many old buildings has outgrown its original purpose in the last decade. It is a gorgeous Renaissance Revival building with a soaring clocktower and elegant archways. I remember it as the place you went for stamps and paying bills in the good old days. In fact, as a fresher student in O Week I had to do the dead ant dance on its steps with my fellow freshers – makes me so glad not to be a student any more! These days it is full of boutique shops. The little laneway between the GPO and Myers Department Store is full of stylish eateries which get very busy at lunchtimes but were quiet mid afternoon. I stumbled across Kenzan @ the GPO last year and was amazed at their roll your own sushi. Now I have wondered if I am the last person in Melbourne to discover this (apart from E who didn’t even know this little laneway of eateries was here) and if it is available elsewhere. The vegetarian sushi fillings are fairly standard – carrot, cucumber, mushroom and avocado. But when I buy sushi at most places it has been rolled for sometime and the nori sheets around the rice have softened. The Kenzan sushi is sold in a funny packaging which keeps the rice and nori separate so you actually roll the nori around the rice cylinder just before you eat it. The crispness of the nori against the soft rice is a pleasing meeting of textures. These are not sushi to take away and munch on the run. It is best to stop at the simple stools and tables set up in the laneway – where vehicles once travelled according to signs on the GPO’s stone walls – and concentrate on assembling your sushi. The wrapper includes instructions which are welcome when faced with layer upon layer of plastic. Too much packaging to be environmentally friendly which is a shame given the delicious results. I also had a salad of radish, avocado, carrot, cucumber, lettuce, wakame, tomato and broccoli. A lovely selection of fresh vegetables but next time I wouldn’t bother with the dressing which was bland and much too oily for my liking. And I had a bottle of Emma and Tom’s Kamarama juice. A much healthier and more interesting snack than the cake which we had intended to find. I have made many chilli non carnes in my lifetime but this blog has got me out of a rut and trying different recipes. My favourite discovery is the addition of cocoa for the dark slightly sweet and bitter edge. But I have long wanted to try the lager chilli and jalapeno butternut cornbread that Cassie seems to enjoy regularly on Veggie Meal Plans. I don’t drink a lot of beer but I love it in a stew or a bread. This chilli non carne recipe included lager and cocoa so I knew I’d love it as much as Wendy. I followed the recipe pretty much but added more vegetables. I omitted the chilli powder but because this was my chance to use the cute but fiery red chilli peppers that my friend Penny gave me. The chilli non carne was an excellent combination of fragrance, flavours and heat. Chili and cornbread is a classic and comforting combination. I loved the idea of Cassie’s cornbread with pumpkin and oats. It seemed like the perfect way to use up my leftover egg from glazing my pot pies. Egg is a necessary evil for me. I like the effect it has but I hate leftovers. I dislike the omelettes, scrambles and other ways people seem to use up eggs. I avoid recipes that use only an egg white or an egg yolk because I then have to work out ways to use the other half. If I was more organised I would freeze them like Haalo and use them for elegant plum friands. So imagine my disappointment to re-read the recipe at lunchtime and remember that Cassie is vegan. Then I got home and found E had used all the milk this morning (I know it is not vegan but at least it feels an easy swap with soy milk). So I used the rest of the buttermilk and my leftover egg. But I loved this bread so much that I will try it vegan some time. It is moist and full of flavour. And the recipe made me think of some cultural differences that intrigue me in blogging apart from the term chili. As I have discussed before, when I lived in the UK, pumpkins were as scarce as hen’s teeth. Now I have noticed that in America so many people seem to use pureed pumpkin from a can. I don’t know if you can even buy it in a can here in Australia but there are always large wedges for sale in any market or supermarket. I have found that it is quite easy to cut it into small chunks, put it in the microwave a few minutes in a plastic container and use a fork to mash it up. So simple it makes me wonder why it needs to come in a can. But I recently saw Ashley saying she wished for a pumpkin recipe that uses a whole can when baking her wonderful pumpkin pecan raisin muffins. Yet there are so many uses for pumpkin. It is excellent in chocolate cakes, scones or stews. I had a little of mine leftover from the bread and remembered a friend’s mother had told him that pumpkin will thicken a stew so I put my leftover in the chilli non carne. The other cultural difference that made me curious was Cassie putting a bottle of lager in her recipe. (Actually she called for 2 but I halved the recipe.) How big is a bottle? Does she mean a stubby (375ml) or a long neck (750ml). I have assumed the former but I did wonder what is standard for a bottle of lager in America. I used one of our old-school and misleadingly titled Melbourne lagers that I drank too much as a student – Victoria Bitter. According to Wikipedia it has the highest market share of all beer sold in Australia but I don't drink it often these days. It does however make an excellent chilli non carne. I am sure that Jeanne at Cook Sister will appreciate this fine chilli non carne. She is hosting this month’s Waiter There’s Something in My … Pulses and is welcoming all recipes with beans, lentils, chickpeas and legumes of all varieties. Heat oil in a stockpot over medium heat. Add onions, carrots and peppers and cook until softened. Stir in garlic and chillis and cook for 1 minute. Add spices and stir (I did this off the heat). Add tomatoes and lager and bring to the boil. Add beans and remaining vegetables. Bring to the boil, cover and simmer for 20 minutes, stirring occasionally. Remove and discard cinnamon stick. Simmer, uncovered, approximately 10 minutes, or until chili is to desired thickness. Season. Preheat oven to 190 C. Grease and line a loaf tin. If using soy milk, place tablespoon of lemon juice in a measuring jug and add enough soy milk to make up one cup. Leave for 5-10 minutes to thicken. Then add oil, agave and pumpkin. If using buttermilk and egg, mix with lemon juice, oil, agave and pumpkin. Place dry ingredients in a medium mixing bowl and mix. Add wet ingredients and stir til just combined. Spoon batter into prepared loaf tin and bake for 25-35 minutes or until a skewer comes out clean. Sit a few minutes and then turn onto a wire rack to cool. I have wanted to join in but me and pastry don’t get on very well. Scrunching pastry in a ball is more my scene than rolling it out. I don’t think I have one proper pastry recipe on my blog. You would think I have never made pastry before. I have and I will again but it really is not my thing. This month the mini pie ladies have called for mini pot pies. I felt inspired to try a Farmhouse Pie recipe that my housemate Will used to make. I have tried it before and failed miserably. In fact, I have even written on the recipe to suggest that I make the filling and serving it with a baked sheet of puff pastry! But I felt that if I did it in a ramekin with just a top then it just might work. I went to the freezer and found my packet of puff pastry had sat there so long it had gone off! I really am not a pastry person. I bought more puff pastry, I made the pies, and then I re-read the guidelines. It said that these pies were to be made from scratch. They want me to make my own pastry? Too late for that. It is just like reading the recipe properly after I have made dinner (which I have been known to do – and to prove it I just realised I forgot to add the stock powder to the water when making these pies - oops). I hope Ann and Karyn will appreciate my efforts and realise it is a big step for me to even make a proper pastry pie and will accept my humble pie to encourage me to make better (if not bigger) pies. E and I really enjoyed our pies anyway. The weather has suddenly gone so cool that we turned the heater on tonight. Perfect for pies. This is a creamy pie that Will adapted from a Farmhouse Chicken Pie recipe. The tempeh tastes great in it but 'Farmhouse Tempeh Pie' doesn’t have the same ring to it. Have you ever been to a farm and seeing little tempehs running in the yard? The ramekins made doing the pastry so much easier and I had fun with some heart-shaped cutters that I bought in Darwin last month. Serving them in ramekins meant that it was like being in a pub in Scotland where you get a pie or lasagne cooked in a little dish on a plate with chips and vegies. I couldn’t resist doing chips and vegies for a laugh. It suited me, as I am trying to clear some of the lurkers from my freezer (the chips were hiding in the back with the pastry!). But to eat it, we scraped the pies from the ramekins as I have never understood how you are meant to eat from a little dish with a knife and fork. But when faced with pastry, E’s love of tomato sauce makes sense. And despite my aversion to cooking with pastry, I can easily understand why pies have long been good hearty winter fare. Heat oil in a large frypan and fry tempeh til starting to brown. Set tempeh aside. While the tempeh is frying, place a ramekin upside down on a square of pastry and use a small sharp knife to trace a circle around the ramekin. Repeat so that you have 4 circles of pastry that will be the pastry lids for the pies. Preheat oven to 210 C.
Melt butter in the large frypan and fry mushrooms for a few minutes til butter is absorbed and the mushrooms are starting to release their juices. Sprinkle with flour and stir for 2-3 minutes over low heat. Add liquids and stir until mixture boils and thickens. Stir in tempeh, capsicum, peas, cheese and parsley. Remove from heat. Spoon filling into 4 ramekins. I didn’t grease these and the filling didn’t quite reach the top. Place a circle of pastry on top of the filling in each ramekin. Use leftover pastry (or a second sheet) to decorate the pies. Make a hole in the centre of the pastry for the hot air to escape. Brush pastry with beaten egg. (I brushed it and then added pastry decorations and then brushed it again). Bake in hot oven for 15-20 minutes (the recipe is a bit odd – it says to bake at 205 C for 15 minutes and then at 175 C for 25-20, but I found that 20 minutes at 210 C was enough) until the pastry is golden brown. We went to my mum and dad’s for Easter Sunday lunch. Just a few of my siblings were there (including my sister Christine who was visiting from Dublin and brought her husband Fergal to meet the family after being married for almost a year!). My mum made a roast dinner which we all love. I took down a nut roast that I had made the previous day. It is one I have made a few times before and was surprised to see it was gluten-free. This meant that my sister Susie could have a slice. Christine and Fergal were also partaking as they are not so keen on roast lamb. It is a good tasty nut roast with lots of vegetables although it lacked the yeasty density of breadcrumbs. My mum always makes lots of vegetable dishes to have with her roasts. The bigger the occasion, the more side dishes! On Sunday it was a great spread of roast potatoes, roast pumpkin, peas, broccoli, and Susie’s gluten free cauliflower cheese. Nut roasts are sociable dishes because they allow me to share the other dishes which go with my nut roast as well as with roast lamb. I had chutney with the nut roast rather than mint sauce and gravy, but I was glad to able to share the wonderful golden crunchy roast potatoes. And with my mum, we are always guaranteed some delicious dessert. For sweets on Sunday she served pavlova, lemon meringue pie and caramel tart. I could not resist a slice of her caramel tart which is a bit like banoffi pie but everyone in my family agrees it is much much better. Maybe one day I will post the recipe. 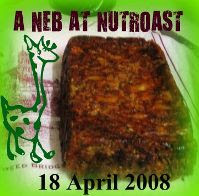 This nut roast will go to my blog event, A Neb at Nutroast. 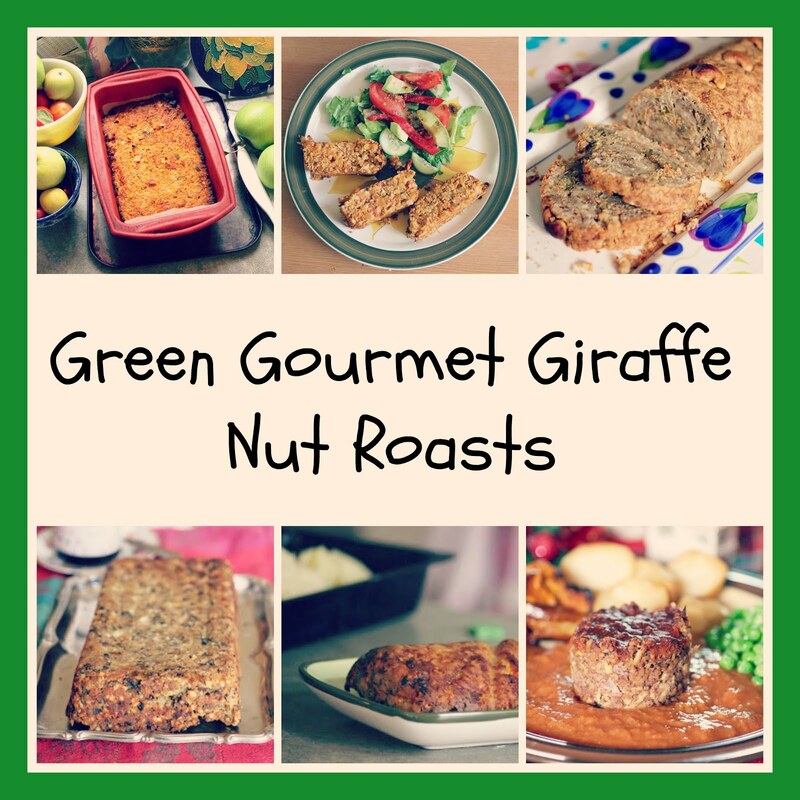 This is an event where I am encouraging you to make nut roasts, post about them and send them to me by 18 April. If you are interested and/or need advice and ideas, check out this link. Lightly grease a 14 x 21 cm loaf tin and line with baking paper. Preheat oven to 180 C.
Heat oil in frypan and add onion, pepper and tomato. (I just add them as I chop them.) Fry for 5-10 minutes over medium high heat. The recipe says to fry til pepper is tender but I prefer to fry til most of the tomato juice has evaporated. The recipe also says to cool but I don’t bother. While the vegetables are frying, place the remainder of the ingredients in a medium-sized mixing bowl. When vegetables are ready, tip into the mixing bowl and mix all ingredients to combine. A desire to try a polenta based pizza, the opportunity to take some for my sister and niece to taste yesterday, and a blog event on gluten free party food, were all inspiration for making a version of the Zucchini Polenta Tart from Chocolate and Zucchini. A trip to the supermarket to buy ingredients didn’t bode well. Riding my bike home my zucchini was in a calico bag which somehow got mashed in the spokes of my bike so some zucchini had to be discarded. (see the photo!). Together with cracking the lid of my food processor and pulling apart a springform cake tin recently, it is beginning to look like a trail of destruction. Happily, the tart overcame all obstacles. Clotilde called it a Zucchini Polenta Tart because it really only had zucchini and a little parmesan on it. I desired her crispy base but needed more than one vegetable, because I had envisaged that mine would be more pizza than tart. Some time ago I had found a recipe for Veganmania’s Polenta Pizza. Like a magpie, I used bits of both recipes as well as my style of pizza-making. I served it straight out of the oven, accompanied by leftover Autumnal Roast Vegetable Salad. The base was crisp outside and oozy inside but not terribly tasty. When I tasted it after it had sat for some time I could taste the flavours in the polenta base more. I recently came across some advice on salt which noted that high heat dulls the taste buds, so food should be cooled before tasting. But the intense flavourings of the toppings were excellent. I enjoyed the base but I am not sure I would claim it tastes like a regular bready pizza base. But if I did this again with pizza in mind, I would make less polenta (probably 1 cup like Veganmania, not 1½ cups like Clotilde) to make a thinner base. I was surprised at how long it took to bake. It is probably no longer than making a yeast pizza base from scratch, but a lot slower than a pre-made pizza base. Veganmania’s recipe instructed to spread the polenta base into a pizza pan, cool 10 minutes, add toppings, bake 20 minutes and put it under the griller (broiler) for 10 minutes. I would be interested to try following this style of preparation but I would probably leave it in the oven a bit longer. I would also be interested to try it with my usual pizza toppings (tomato sauce, capsicum, mushrooms, olives, cheese). I took the leftovers to my parents’ yesterday, for my gluten free sister and niece to sample. When I showed it to my little niece, Grace, she immediately said, ‘I don’t like it’. (I don’t think she has tasted pizza before.) I shrugged and had a small piece myself. Grace then decided to taste a piece and declared that she did like it after all. Small kids are so fickle. I left before my sister Susie tasted it so I am not sure what she thought. Lastly, I am sending this to Linda from Make Life Sweeter who is hosting an event with the wonderful title Go Ahead Honey, it’s Gluten Free. This month’s theme is Birthday Baking for Children. Pizza is perfect party food that most kids love, and would particularly please kids like Grace who do not have much desire for sweet baking. Soak the polenta in 1½ cups water. While it is soaking, bring 3¾ stock to the boil in a medium saucepan. Gradually add the polenta and water mixture and whisk as it is added. Stir constantly over low heat for 7-10 minutes until it is thickened. 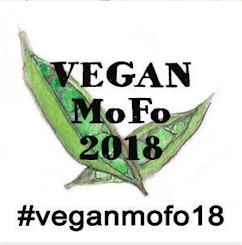 (Alternatively, follow the instructions on your packet – I followed Veganmania’s instructions because my packet said to stir 1 cup polenta in 1 cup water for 30 minutes!). Place some on a spoon to cool a little and taste before adding seasoning as desired. While the polenta cooks, prepare the vegetables. Slice the very tops of the garlic bulb off and wrap in foil. Place in the oven for 30-40 minutes until the garlic is soft and sweet. Trim and thinly slice the zucchini and squash. (If squash is hard to find just omit and use a little more zucchini – I like the contrast of the yellow skin.) Place in a baking tray (I lined mine with baking paper) and toss in a little olive oil. Sprinkle with a pinch of salt and a generous grind of pepper (you may want to omit pepper if making for kids). Roast in middle shelf of the oven for about 30-45 minutes, stirring once or twice, until soft and wilting but not falling apart. When the top and sides of the polenta are crisp, turn out onto a pizza tray or a baking sheet and return to the over for 15-25 minutes to crisp the bottom (which will now be the top). By now the garlic should be roasted. Cool a little and squeeze garlic bulbs from the skin. Chop finely. Also chop the sun-dried tomatoes. When the polenta is crisp all over, remove from oven and spread evenly with garlic and sun-dried tomatoes. Pile the zucchini over the top. Scatter the olives on the pizza and sprinkle with cheese. Return into the oven for about ten – twenty minutes or until the cheese is golden brown. Serve warm, at room temperature or cold. * To make this dish vegan, just omit the grated cheese and sprinkle nutritional yeast over the garlic and sun-dried tomatoes. At the start of the week it was too hot to bake soda bread. The end of the week finds the weather too cold and I have had to put on the heater to make sure the bread has a warm place to rise. That’s why we say Melbourne has four seasons in one day! It brings to mind a fine Australian poem that most older Australians would have read at school. I have copied the choice bits to give you a taster but I encourage you to check out the full poem here because it is such a delight. Now back to last night’s dinner! When I was planning my hot cross buns, I decided I would make it a bread baking day. So I had a search for breads that took my fancy and decided on a Cheese and Onion Bread. E and I agreed it was very British. When I lived in Scotland, for a time one of my favourite lunchtime snacks was Gregg’s cheese and onion pasties, whereas E loved Walkers cheese and onion crisps. I have been eyeing off Veganomicon in the bookstores and swithering over whether to purchase it. I am very tempted but also am mindful that I haven’t cooked much from Isa Chandra Moskowitz’s other cookbook, Vegan with a Vengeance which I have owned for about a year. So my challenge is to try and cook more VwaV recipes and if I do, then I can justify buying Veganomicon. Meanwhile, I still find inspiration in bookstores, I am sorry to say. There is a recipe in Veganomicon, called Autumnal Root Vegetable Salad with Maple Fig Dressing (if I remember the title rightly). It features roasted purple potatoes, beetroots and orange sweet potato. I couldn’t resist the dazzling colours. Isa uses dried figs in her salad but I have been keen to find ways to eat fresh figs that seem to be everywhere right now. Not having the book with me, I turned to VwaV and found a maple glaze for inspiration. Finally, I destroyed its vegan credibility by topping it with a yoghurt sauce that was flavoured with Holler’s gorgeous pea pesto. Dinner was delicious. My biggest disappointment was the purple congo potatoes which did not roast well. They tasted floury rather than fluffy. But I did take great pleasure from the darkness of the roasted vegetables which looked superb against the green leaves, the deep pink of the figs and the pale dressing. E didn’t like the figs but I thought their sweetness tasted fantastic with the yoghurt sauce and was a nice foil for the intensity of the roasted vegies. The bread was light and soft but I served it warm - unfortunately the deep cheesy flavour did not show until the bread cooled down. But I highly recommend this dinner for autumnal days when the nights are growing darker and colder. * Those with Australian measuring cups beware! When I made the hot cross buns, 4 cups of flour was meant to equal 600g of flour so I am wondering if I should have used less flour in this recipe. See Susan at Wild Yeast on the advantages of weighing over cup measures. Melt half the butter in a frypan and fry onions til golden. This took me about 15-20 minutes over a low heat. Cool. Place flour, yeast, mustard powder, seasoning and ⅔ of the cheese in a large bowl and mix. Make a well in the centre and add the milk and water. Mix to a soft dough and turn out onto a lightly floured board (you wont need much more in the way of flour for kneading this dough). Knead about 10 minutes til smooth and elastic. Place dough in a lightly oiled bowl and turn to coat with oil. Cover with clingwrap and leave in a warm place for about 45-60 minutes until dough has doubled in size. Punch down the dough to release the air and then knead for a few minutes til smooth. The recipe said to make 20 small balls and place them in two rows in a 25 x 10cm bread tin. I don’t have a bread tin so I made 8 balls and placed them together in a nice flower shape on a pizza tray. Cover with clingwrap and leave in a warm place til rise for 45 minutes. Meanwhile preheat oven to 190 C.
Place potatoes, sweet potatoes, beetroot, maple syrup, mustard and garlic in a large roasting tray. Drizzle with olive oil and mix well. Season to taste. Roast for 1½ hours at 200 C or until vegetables are soft. To make yoghurt dressing mix ingredients. I used pea pesto but lots of other flavours would work here, even just yoghurt by itself or (if you want to be true to Isa’s vegan intent), a nice vinaigrette with maple syrup and mustard (because the flavours don’t come through very strongly in the roasted vegies). To serve, place spinach leaves on a plate. Arrange roasted vegetables on the spinach, then top with figs and drizzle with dressing. (NB: Isa suggested arranging the vegetables in circles of different colours). At this time of year I can’t help but remember Sister Mary in our religion classes telling us that Christmas is an easy celebration because everyone loves a newborn baby but Easter is more difficult because it is about death and mystery. It is a lot harder to understand and celebrate. It is Good Friday today. Shops, schools and businesses have closed their doors. Holiday makers have left town. The streets are quiet. All you will find is the silence and emptiness reminiscent of the bereft feeling after a loved one departs. Best to stay at home and bake hot cross buns. That is what I have done the last few years, including this one. My mum always baked hot cross buns for Good Friday when I was a child. She baked a lot of bread and I loved helping her. But it was the hot cross buns that were special. The cross is symbolic of Jesus dying on the cross which we were told showed how much God loves us. We learnt that it is the holiest and darkest day on the church calendar. Even then, I think we understood that food was connected to religion and culture. My mum still bakes with her grandchildren. When I rang today she was over to visit my nieces with hot cross bun mixture. Baking bread with yeast is something I don’t do as often as I would like, but it is easier thanks to the time helping my mum as a child. My mum has baked enough bread to be quite comfortable with yeast. She prefers fresh yeast so she would show us how the cake of yeast became runny and gooey when mixed with sugar. We would have a go at kneading the dough before she did it properly. She made us feel the dough to check how the texture changed to resemble an ear lobe. She told us that the dough was ready when we stuck fingers in it and it didn’t bounce back into shape. There were lots of little finger marks in her risen dough! Then she would cut the dough into small pieces and we would help to roll them into buns. We weren’t allowed to eat hot cross buns until close to Easter. So unfair, I would tell my parents. The hot cross buns seem to have hit the shops this year straight after Christmas but we only started having them this week. Old habits die hard! On Good Friday my mum would have hot cross buns warming in the oven. We called them HCBs. She would put out a plate of buttered halves. Top or bottom? I loved the tops on my mum’s hot cross buns. The crosses were thick and chewy. The buns were sweet and spicy, crisp outside and fluffy inside. Now that I make my own hot cross buns, I remember doing it with my mum. A bowl sitting on the table filled with rising dough is reminiscent of her kitchen (although she didn’t have a cat on a computer beside it). I make thick chewy crosses just like she used to. The shop buns have thin crosses but they look mechanical and processed. Thick crosses are genuine and made with love. The smell of buns baking, the stickiness of the glaze and the fantastic taste of fresh hot buttered buns all fill me with a nostalgic glow. 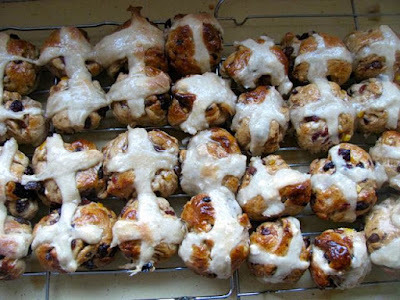 I wont be going to church this year but the hot cross buns are still imbued with meaning. The crosses remind me of my heritage. 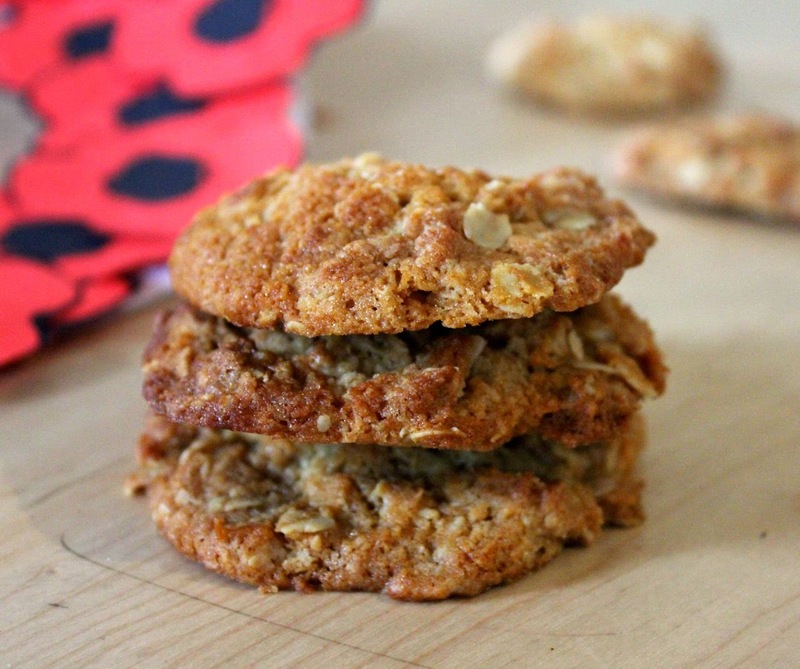 View more Easter recipes from Green Gourmet Giraffe, including alternative hot cross bun recipes (vegan, sourdough etc). Place milk in a jug and sprinkle yeast over it. Stand 5 minutes til frothy (mine doesn’t really go very frothy – just a bit of swelling at the sides but the buns rise anyway). Place flour and spices in the bowl and rub in butter til mixture resembles breadcrumbs. You could do it in the blender but it is quite a relaxing activity. Stir in fruit and sugar. Whisk egg into milk and yeast mixture. Make a well in the flour mixture and pour in the milk mixture. Mix to a soft dough. Tip onto a lightly floured board. (This is a dough that hardly needs any flour.) Knead for approximately 10 minutes until smooth and elastic (this is the moment it should feel like an ear lobe). Use the heel of your hand to knead and put some good rocking music on the stereo and enjoy the rhythm. Lightly oil a large bowl. I rub the bowl I mixed the dough in to remove as much of the dough and then spray it with oil – or you could put a little oil in and rub it around the bowl with your fingers or a brush. Turn the dough in the bowl so it is covered with oil. Cover with cling wrap. Stand in a warm place til doubled in size – this should take about 45 minutes. I turn on the heater to make sure the house is warm enough (thankfully the heatwave is over). Punch down the dough – this is the fun bit! Knead a few minutes til the dough is smooth. Divide into 15 or 16 pieces and knead each bun til smooth. Arrange close together on a tray and cover with a damp teatowel. Stand in a warm place til doubled in size – this should take about 40 minutes. About 10-15 minutes before the buns have risen, grease a baking tray (I use a swiss roll tin), preheat the oven (220 C) and prepare the cross mixture. To make the cross mixture, mix the flour and water in a small bowl until it forms a paste. Note: I have doubled the cross ingredients because I like thick crosses. I just create a paper piping bag when I need it and don’t use a nozzle but just snip the thickness that I want to pipe from the bottom of the bag. There is nothing worse than not having enough so I make too much so I can refill if needed. Any piping equipment will do but it is quite a thick mixture so I wouldn’t advise a really thin nozzle. Don’t worry that this mixture is tasteless. Once the glaze goes on at the end it tastes great. Once the crosses are piped, put buns in the oven at 220 C for 10 minutes. Then reduce to 200 C and bake a further 10 minutes or until buns are browned and hollow when tapped. About 10 minutes before the buns are cooked, prepare the glaze. To make the glaze, place all ingredients in a small saucepan. Stir to combine and bring to the boil. Simmer for 1-2 minutes without stirring. When the buns come out of the oven turn out onto a teatowel-covered wire rack. (My recipe says to turn on to rack after glazing but I think it is easier when not sticky.) Brush glaze on to buns a few times to ensure they have a thick coating. You will have more glaze than you need so be quite generous with the glaze. I love celebrating St Patrick’s Day. It has always been a great excuse to eat and wear green. But it is more than that to me. It is part of my heritage that I can proudly claim. I have many Irish ancestors, especially on my mother’s side. I was named after my maternal great grandmother whose parents migrated to Australia from Ireland. I went to a high school run by the Brigidine nuns and we learnt about hedge schools in Ireland that were run to educate the population in spite of the English. Each year on 17 March we were taught about St Patrick bringing Christianity to Ireland. As a university student I discovered the joys of green beer on St Patrick’s Day. It made me very happy until I learnt that it was made by putting some food dye in the beer and is not popular in Ireland. But I still enjoyed the excuse to eat green and hold green dinner parties. We had green soup, green lasagne and an amazing green cake with a figure of St Pat driving the snakes into the sea. (Creative credits to my house mate Yarrow.) Then my brother and sister moved to Ireland and I would hear their tales of the grand green celebrations in Dublin each year. If you want to see how creative people can be with a bit of food dye, check out Susan’s shamrock shake, Glenna’s green bread, Cakespy’s green soda bread and Cakelaw’s green cupcakes. This year, rather than a burning desire to celebrate with green food, I wanted to make a soup that I came across last year which was called St Patrick’s Soup. For month I planned to make it on 17 March to celebrate St Paddy’s feast day. As the day drew closer I thought that the perfect accompaniment would be soda bread. But the best laid plans of mice and men often go awry. I didn’t count on the heat wave that left me with little energy for cooking, especially anything that required turning on the oven. Then I spoke to my mother who said she was confused about when St Patrick’s Day was this year. According to this article the Catholic Church has declared that St Paddy’s day is to be held on Friday 14 March this year because Holy Week is too sacred for such celebrations. My mum also told me that Easter occurs on the first moon after the solstice, and this year it is especially early because the full moon occurs on the solstice – apparently it wont happen again in our lifetimes so we will not have to face this quandary again. My St Patrick’s Day meal was fine hearty stodge that one of my friends would call Bog Irish. The soup is quite simple but smells wonderful with the pinch of cloves. It is thick and porridgey with lots of oats and the sorts of vegetables you might find growing in those green Irish fields. It is truly nutritious and comforting. The sweet potato version of soda bread doesn’t seem so Irish but it is my favourite soda bread recipe. It has a pleasing orange tinge, great flavour and is wonderfully moist. A challenge presented itself when I got home around 7 and read the instructions and remembered that the bread requires roasting the sweet potato for 45-60 minutes before you start baking. (I might have done it the day before if it wasn’t the hottest March night on record with a minimum temperature of 27 C.) Of all the times I have made this recipe, I think I might have been organised enough to roast the sweet potato only once and it did make a difference but if you aren’t organised a quick bit of microwaving or steaming will still taste great. I also had a good laugh at the requirement to cool the soup before blending. As if I had the time or the patience! My timing was all out, I was tired and I faced more disaster after I put the bread in the oven. It was only then that I discovered that in my haste I had added plain flour rather than self-raising flour when rushing to refill my flour containers. Luckily the bicarb of soda worked its magic all on its pat malone and the bread still was delicious. I made the bread look more Irish by scoring the outline of a shamrock with a knife. I think we all know that St Patrick taught the Irish pagans about the mystery of the Holy Trinity by using the shamrock to explain three in one. But I have been thinking that maybe if he was a cook he might have used a recipe to explain how individual ingredients come together into one delicious dish. 1. Melt the butter or margarine in a large stockpot. Add the onions, potatoes and carrots and fry gently for about 5 minutes until soft. Add the mushrooms, cabbage and ground cloves and cook a further 5 minutes. 2. Add the vegetable stock and oatmeal. Bring to the boil, then cover and simmer for about 20 minutes. Make sure you stir occasionally as the mixture will thicken as it cooks and stick to the bottom of the saucepan. 3. Puree with a hand held blender until the soup is smooth. (If you prefer a slightly chunky soup, just puree half the mixture.) Season to taste. Serve with a swirl of cream if desired. Preheat oven to 180 C. Bake kumara whole for 45-60 minutes. (Alternatively, if time does not permit, microwave or steam kumara in thick slices til soft.) Cool slightly, peel and mash – a fork will do the trick. Measure one cup and set aside. If you have leftovers it tastes great in a sandwich with cheese and chutney. Use a fork or whisk to mix buttermilk and egg in a separate bowl. Add sweet potato and chives and mix well. Make a well in the flour mixture and pour in buttermilk mixture. Mix til dough becomes smooth but do not overmix. Towards the end of the mixing I find it helpful to use my hands and I give a quick knead on a floured board. Form dough into a flattish round of about 4 inches thick and place on a lightly floured baking tray. Use a blunt knife to score lines to make 6-8 wedges or make the outline of a shamrock if you want to make it feel a bit more Irish. Lightly dust with flour. Bake approximately 45 minutes or until a skewer comes out clean. Serve warm with soup. Will last a few days, although you will probably want to gobble it all up immediately. Is excellent with promite or cheese and chutney. Sometimes it feels like in Australia we are truly in the land of topsy turvy! The Canadians complain of snow and we are suffering a heat wave, the Brits celebrate a winter solstice and we are celebrating our summer solstice, the Americans get excited about Spring and here it is Autumn! So spare a thought for us Australians this Easter Sunday as you celebrate new life and new hope that spring brings. We are celebrating this holy day that Blackadder might describe as being as Springy as a Spring day that is very Springy (or maybe that is just what students who have watched too much Blackadder might say)! But we celebrate as the days draw in, the weather gets colder, and we watch the leaves fall from the trees. No wonder I get confused! I write this as Easter approaches and a few blog events are asking us to think about Easter goodies. I am very fond of the Heart of the Matter event which turns one year old this month! That is a year of being challenged to think about heart healthy food. 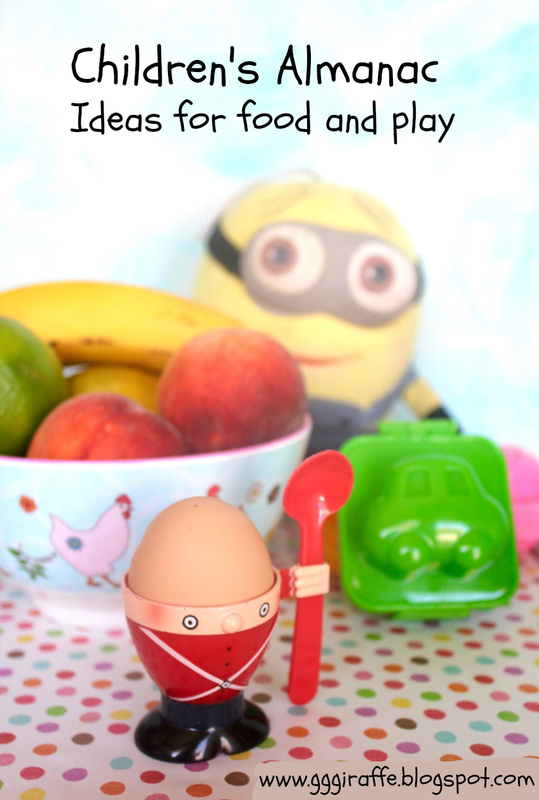 This month Ilva of Lucilian Delights is hosting and the theme is Party Food. Now when it comes to parties, I think decadence and indulgence. I want people to enjoy themselves. But who said you can’t eat healthy and have fun. Just because guests are watching their weight or on restricted diets doesn’t mean they can’t join in the merriment. Party food for me usually involves dry biscuits, dips and crudités, finger food, maybe mini-muffins or grubs and definitely a chocolate cake. Lots of options. But party food at Easter time really demands chocolate! Healthy and chocolate aren’t great mates in most sentences. Then I remembered a recipe I had been keen to try for some time. It is called Spring Chocolate Brownies. It suits my schizophrenic attitudes. I want to celebrate the spring of new life but to prepare for winter, I want to eat chocolate and still be healthy, I want to have my cake and eat it too! Impossible, you say! But I think these brownies make a good compromise. Sitting on the couch in front of old BBC series Century Falls and eating warm fudgy gooey brownies straight from the oven, the answer seemed to be Yes! So if you must have chocolate (and there aren’t many who don’t), this is a comparatively healthy recipe. It is light enough for spring, dense enough for autumn and guaranteed to please everyone at a party! - Place dates in a small saucepan and fill with just enough water to cover them. Cook over low to medium heat til pulpy (about 5 minutes). Puree and cool a little. - Cream dates and margarine (or if you are very impatient like me and the dates are still quite warm you are just melting the margarine in the date puree). - Stir in flour, baking powder and cocoa, Then add banana, blueberries, choc chips, nuts, and vanilla essence. - Spoon mixture into a 7 inch square pan and bake 20-25 minutes. I used a 6 inch square pan and had to bake the brownie for 45 minutes and it still was very soft and a little on the gooey side in the centre. Perhaps my 20cm round cake tin might have been better. Use a skewer to check when cooked but beware melted choc chips! This month Holler is hosting the No Croutons Required blog event that she runs with Lisa. 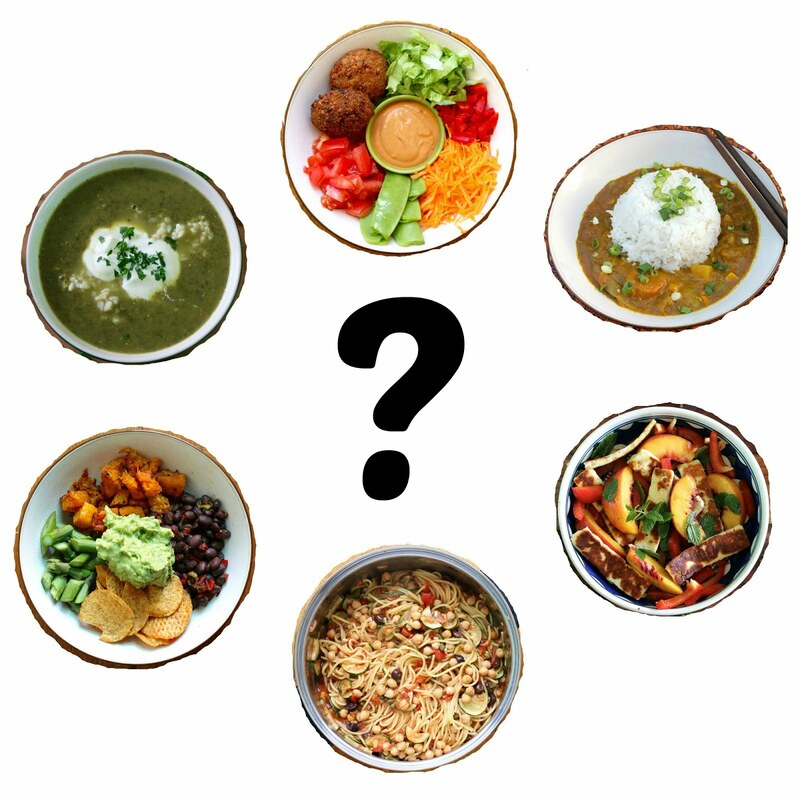 For March, they have asked bloggers to make a spicy soup. Not being a chilli fiend, my mind initially drew a blank. But then I couldn’t open a cookbook without spicy soups jumping out at me – tortilla soup, couscous dumplings in spicy tomato soup, spicy peanut soup, and a pumpkin, corn & wild rice chowder. 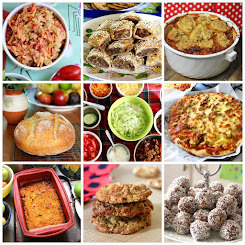 So many great recipes out there! But the soup that really captured my imagination was the vegetarian mulligatawny which Gluten Free Goddess, Karina, made. Why? Because I have only come across it before as a meat soup and I wanted to taste it. Because it is the sort of dish I want to make just to be able to roll the name around on my tongue. (Go on, I know you want to say it out loud!) Because Karina’s version was full of vegetables which pleased me. There was one small problem with Karina’s soup. It seemed to take a lot of flavour from curry powder. My curry powder was bought at the supermarket years ago and I was worried it might not enhance the soup as it should. So I turned to another version of mulligatawny I had found in Cooking with Kurma. I had initially rejected it because it seemed quite watery – one of those soups where you cook up lots of interesting flavours and then discard them (after sieving) in the hope they leave their flavour in the water. But the idea of using Kurma’s spices and Karina’s vegetables appealed. It seemed the best of both worlds. Once I had decided on making mulligatawny, I had to check on the traditional recipe to see how close my recipe compared. A quick search of the internet convinced me that the traditions were as flimsy as the English Empire’s pretext for colonising India. (Actually I don’t know why they did but colonisation always seemed to be about greed and power which is never a satisfying reason! I will find out later.) Apparently, mulligatawny means pepper water and was eaten by British colonists in the mistaken belief that it was what the locals ate. I have read that traditional Indian cooking does not really include soups. It would be fascinating to have been there when some Indian was persistently questioned about what soups they ate. I can only imagine that the person who gave the recipe had a good sense of humour and enjoyed much laughter when seeing the Brits with their ‘traditional’ mulligatawny. After reading about mulligatawny's dubious origins, I felt quite comfortable in making a hamfisted attempt at messing with the recipes. I felt I produced the peppery taste but possibly included more vegetables than is traditional. I added a few vegetables to rescue them from the back of the fridge. I didn't have a muslin cloth to put my spices in so I improvised with a tea infuser - I don't drink tea when it is this hot, so at least it is not just gathering dust. I was quite forgetful as I made it and added the garlic and ginger later than I should have. Then I totally neglected to add lime juice and sugar but I don’t know they would have improved it. I am happy to report that I was most pleased with my mulligatawny and now curious to try more. It was a delicious subtly-spiced soup with sweet flavours of the spices, the tartness of the apple and a touch of creaminess from the coconut milk. With all those vegetables, and chickpeas too, it must be nutritious as well as vegan and gluten free - something for everybody! I am sure Lisa and Holler will love it. Heat the olive oil in a large stockpot. Fry the onion for 2-3 minutes over low heat. Add the onion, garlic, ginger, chilli, carrot, potato, zucchini, cauliflower, apples, sweet potato and cabbage and sauté until softened, stirring frequently - approximately 7 to 10 minutes,. Place cardamom, cloves and pepper in a piece of muslin or in a tea infuser and place in the stockpot. Add cinnamon stick, stock, tomatoes and chick peas. Bring to a boil and reduce heat. Cover and simmer, stirring occasionally, until vegetables are tender, - about 20 to 30 minutes. In a small frypan melt the ghee over low heat. Add mustard seeds and cumin seeds and fry til they begin to pop. Remove stick of cinnamon and tea infuser of spices from the stockpot. Discard. Add seeds and coconut milk and stir. Use hand held blender to blend as much as you require. I only blended slightly so there were still lots of chunks but you could blend completely or not at all. Check seasoning. Grind some fresh pepper on the soup for garnish. Saturday found us in the city and hungry. We headed for the bustling Centre Place and were glad to find a table in Issus. It is a place we have frequented on occasion for Saturday morning brunch. As usual E’s problem is that he must choose from many items on the menu while my decision-making is made easier by the few choices available to an egg-phobic vegetarian. I chose the big vegie brekkie with baked beans instead of eggs. It came with beans, buttery spinach, soft avocado, grilled tomatoes, fried mushrooms, crisp hash browns and sourdough toast. I couldn’t ask for more in a fry-up. I was pleased that the bread was not buttered and h ad a chewy crust but it could have been a little more substantial. But generally it was a pleasing combination. I also had a huge brandy balloon of freshly squeezed orange juice. E was less happy with his choice and found the noisy atmosphere too overwhelming. It did seem more crowded than on other visits. The staff were quite busy and it was hard to get their attention, but service was pleasant and we weren’t kept waiting long. I was saddened that they have painted over the green walls and the walls are now orange and brown. I think the chairs have also changed to stools which I am not keen on. But I still like that it is open to the alleyway that is Centre Place and it does a good vegie breakfast. It does make me wonder if Issus is a victim of the new-found popularity of Melbourne’s laneways or if it was bad luck to visit on such a busy day. More concerning is the changes to the graffiti and art boxes at the end of the lane by Centreway Arcade. They seem to have been boarded up as though the council is trying to discourage any creativity. After our brunch, we had a browse in some shops and then visited the museum at the magnificant Old Treasury Building. It has beautiful historic interiors of wooden panelled doorways and chandeliers. The museum gave some insight into Melbourne’s history – Aboriginal people, the gold rush, boom and bust, Smellbourne, leisure and a wonderfully recreated 19th Century meeting room. Then there are the vaults in the basement and the recreated living quarters of the caretaker’s family. E loved some of the old gramophone records on display and I loved the panoramic photos of Melbourne from 1862 when the building was completed. If you are after the new, visit Café Issus, but if you want to see some of old Melbourne, I highly recommend this museum. I wanted to make this pie on Thursday night but it was too hot – at 6pm it was still 37 C! We had soup from the freezer instead. It was hot again yesterday – 40 C. Ideally I would just live on salads and burgers or vegie sausages when it is so hot. But I have been wanting to make this pie for ages and had the ingredients. E was pleased because he wants a hot cooked meal every night no matter what the weather – you can take the boy out of Scotland but you can’t take Scotland out of the boy! First instruction in the recipe was preheat the oven. Gave me a laugh. If I must use the oven in this weather, any inclination towards preheating goes out the window. It makes me remember being 15 years old and moving house. We went from a kitchen with an electric oven to one with a gas oven. My mother was delighted and told me that I could bake any time I wanted now because we didn’t need to preheat the oven. Ever since I have been of the notion that gas ovens don’t really need preheating. I have included preheating in the recipe and often do in other recipes but I don’t always preheat. Especially when it is swelteringly hot. This pie does have a bit of a summery green feel to it. It is a little like spanakopita but isn’t packed with salty firm fetta, so the spinach and leeks are more of a feature. The filling is quite moist and creamy with the additional nuttiness of cashews, and the fresh flavours of tomatoes and basil. The best thing about this pie is the pastry. If like me, rolling out pastry makes you want to screw it up in a ball and throw it in the bin, then this is a pie for you. The topping actually does involve screwing up filo pastry in a ball. In my more poetic moments, it reminds me of pastry roses. But the effort is so minimal that you would not work up a sweat. Suits me on a hot day. Luckily by the time we ate, the cool change had come and we could eat dinner outside. Sadly being outside in the refreshing breeze meant I forgot to turn off the oven and it took quite a bit longer for the house to cool down. Preheat oven to 190 C and bake tomatoes for about 10-15 minutes. (The tomatoes shouldn’t be too soft because I think I overcooked mine this time and they were less noticeable in the pie.) Cook spinach in large covered pan 2-3 minutes til wilted. Drain and squeeze excess liquid. (I defrosted 500g frozen spinach and just drained most of the water off). Gently cook leeks (I used 1 leek and most of a bunch of spring onions) and garlic in oil til soft – about 3-5 minutes. Add spinach and basil and stir til combined. Remove from heat and add ricotta, parmesan, eggs, cashews and stir. Gently stir in tomatoes last. Season. Spoon into a 25cm ovenproof dish. Cut filo sheets into 4 squares each. Spray each square with oil spray and scrunch up like a rose (or a piece of paper you are about to throw in the bin). Place on pie. Repeat with remaining filo til you have covered the pie. Bake for 20-30 minutes until pastry is golden brown. It is good served with sauce or chutney. Last weekend was the Labour Day long weekend. E and I went for a day trip to the country. We decided to go to Woodend, about 50 minutes drive from Melbourne, because there was a Lions Art Show in the church hall. We stopped at a lovely café in a giftshop called Maloa House. It was all airy high ceilings, artwork on colourful walls and wooden counters. I liked it but E thought it too brightly lit (all the better for photographing my meal!). The shop also sold soaps, candles, lamps, beautiful crockery and gourmet groceries. I had a herb and parmesan risotto cake topped with sweet potato, caramelized onions and stilton. It was presented with panache! The swirl of tomato sauce and herb sauce looked professional. I would have preferred a bit more sauce, but the sweet potato, onion and cheese added an interesting combination of intense flavours. But I was happy that I also ordered the bean salad. Without it the risotto might have been a bit dry. It was this salad that attracted me to the place. It comprised very light dressed cooked green beans, olives, semi dried tomatoes and potato. I’d go back just for the salad. It was deliciously simple. The art show was nice but quite traditional – E couldn’t believe that one of my favourite paintings was of a beetroot! We also enjoyed a wander around Woodend. It feels like the tree-changers have infiltrated – I imagine quite a few of the residents commute to Melbourne daily. What does this mean? Gift shops of candles, soaps & quaint garden rustic furniture; quirky shops like Uncle Festers that sell witches wands and pentagrams made on the premises; a great second hand bookstore; and gourmet delicacies abound. I was surprised that not only could I find a vegetarian meal quite easily, but that there was also a good selection of gluten free food. We found excellent friands at Bites Deli and were sad that the Literary Latte was closed so we couldn’t have a drink there – but maybe next time! I left having purchased dried blueberries at Maloa House and parmesan cheese at the Deli, plus some mulled wine oil burner wax from Habitat. Not a bad haul from a country town. I still think of country towns being like the one I lived in as a child where having a dim sim or a chiko roll with my fish and chips was the height of sophistication! But the times they are a changing. Pomegranates - the cruelest fruit?